HAMID KARZAI, President of AFghanistan, said the world was being shaken by the depravity of fanatics who had insulted the faith of more than 1.5 billion Muslims. Strongly condemning those acts, whether they involved the production of a film or the publication of cartoons, he said they could never be justified as freedom of speech or expression, and nor could they provide a reason for genuine protests to be used as a pretext to incite violence and chaos entailing the terrible loss of innocent lives. Islamophobia was a worrying phenomenon that threatened peaceful coexistence among cultures and civilizations, he said, calling upon politicians and media in the West to confront all its many forms and manifestations. “It is incumbent on us all to advance the cause of dialogue and cooperation, to fight the forces of division and hatred and to fulfil the promise of a better and brighter future for coming generations,” he emphasized. 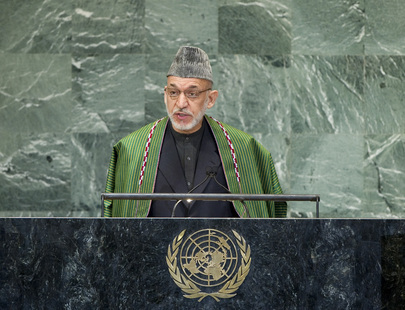 “We must work to defeat the protagonists of the conflict of civilizations and support the voices of tolerance and understanding.” Afghanistan was a testament to the benefits of multilateral cooperation and international solidarity, he said, recalling that a decade ago, the country had been decimated in all respects. Now democracy had taken root, and health services and education were accessible in all corners of the country. Today, Afghanistan was pursuing the cause of peace and an end to violence, he continued. Convinced that military force alone was not an adequate strategy to bring about security, he said the peace and reconciliation process aimed to bring all elements of the armed opposition to peaceful lives in society. Recalling the assassination of Burhanuddin Rabbani, Chairman of the High Peace Council, he said he was proud that the professor’s son, Salahuddin Rabbani, had stepped in to lead the Council as part of the delegation in New York. He added that his “hand of peace and reconciliation” remained extended not only to the Taliban, but to all other opposition groups wishing to return to dignified, peaceful and independent lives in their homeland. “What we ask of them in return is simple: an end to violence; cutting ties with terrorist networks; preserving the valuable gains of the past decade; and respecting our Constitution,” he continued. Further necessary actions included requesting the Security Council’s Taliban Sanctions Committee to take more active delisting measures, engaging in close dialogue with Pakistan and giving national priority to the assumption of full security responsibility by Afghanistan’s own forces. Consolidating international commitment and partnership had resulted in a long-term training commitment from NATO and other partners, he said, adding that the Istanbul Process had presented a new agenda across the region. He concluded by welcoming the appointment of Lakhdar Brahimi as the new Joint Special Representative for Syria, and expressed Afghanistan’s support for the Palestinian people’s right to an independent State.